There are a lot of big organisms out there. A small handful of these are truly massive. When someone mentions big plants, minds will quickly drift to giant sequoias or coastal redwoods. These species are indeed massive. The tallest tree on record is a coastal redwood measuring 369 feet tall. That's a whole lot of tree! What some may not realize is that there are other plants out there that can grow much "taller" than even the tallest redwood. For instance, there is a group of palms that hail from Africa, Asia, and Australasia that grow to staggering lengths albeit without the mass of a redwood. 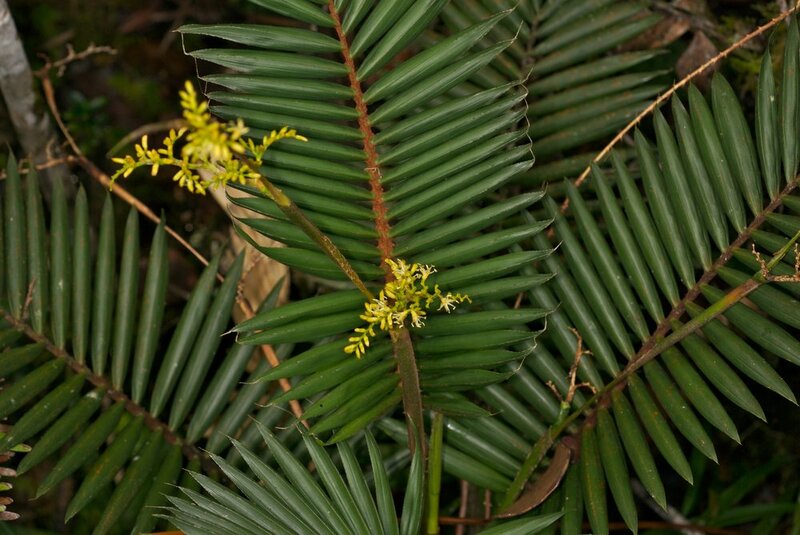 You are probably quite familiar with some of these palm species, though not as living specimens. If you have ever owned or sat upon a piece of wicker furniture then you were sitting on pieces of a rattan palm. Rattan palms do not grow in typical palm tree fashion. Rattans are climbers, more like vines. All palms grow from a central part of the plant called the heart. They grow as bromeliads do, from meristem tissue in the center of a rosette of leaves. As a rattan grows, its stem lengthens and grabs hold of the surrounding vegetation using some seriously sharp, hooked spikes. For much of their early life they generally sprawl across the forest floor but the real goal of the rattan is to reach up into the canopy where they can access the best sunlight. Rattans are not a single taxonomic unit. Though they are all palms, at least 13 genera contain palms that exhibit this climbing habit. With over 600 species included in these groups, it goes without saying that there is a lot of variation on the theme. The largest rattan palms hail from the genus Calamus and all but one are native to Asia. Many species of rattan have whip-like stems that would be easy to miss in a lush jungle. Be aware of your surroundings though, because these spikes are quite capable of ripping clothes and flesh to pieces. The rattans are like any other vine, sacrificing bulk for an easy ride into the light at the expense of whatever it climbs on. Indeed some get so big that they break their host tree. It is this searching, sprawling nature of the rattans that allow them to reach some impressive lengths. Some species of rattan have been reported with stems measuring over 500 feet! Getting back to what I mentioned earlier about wicker furniture, rattans are a very important resource for the people of the jungles in which they grow. They offer food, building materials, shelter materials, an artistic medium, and a source of economic gain. In many areas, rattans are being heavily exploited as a result. This is bad for both the ecology of the forest and the locals who depend upon these species. The global rattan trade is estimated at around $4 billion dollars. Because of this, rattans are harvested quite heavily and many are cut at too young of an age to re-sprout meaning little to no recruitment occurs in these areas. There is a lot of work being done by a few organizations to try to set up sustainable rattan markets in the regions that have been hit the hardest. More information can be found at sites like the World Wildlife Fund.